It may not surprise you that the Italian car company Fiat also owns other manufacturers named Alfa Romeo, Maserati, Ferrari, and others. But, did you also know that the same Italian powerhouse also owns a piece of Americana? Chrysler, Dodge, Jeep, and Ram are all owned by Fiat. Owning so many brands is a boon for the bean counters in each brand. It makes it easier to leverage models across the manufacturers. Leveraging in such a way spreads costs of development of one vehicle across all the brands, instead of each brand developing their own models. So now, even Maserati and Alfa Romeo are rumored to be working on SUVs based on the Jeep Grand Cherokee, and the new Dodge Viper (expected in 2012) is rumored to be a Ferrari or Alfa Romeo chassis with Dodge body styling cues. I can understand the cost savings in leveraging. But, let’s hope that legends don’t get lost in the process. 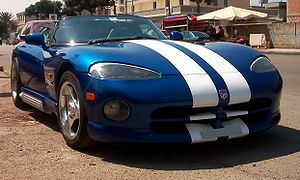 I think bringing the Viper to market with Italian mechanicals would be a shame. The Viper was always about brute muscular deep-throated exhaust tunes mixed with the sounds of shredding tires. I have no doubt that the replacement for the Viper would be just as good if not better than the last one that rolled off the assembly line. However, the Viper has a legend all of its own. So, maybe the name should be retired too, instead of having a reinvention of the same idea. What I’m saying is that I’m all for a Viper replacement of a different name. Let the Viper name retire into the Hall of Fame it deserves. The new product shouldn’t try to make an Italian accented exhaust burble while wearing a Viper badge.